Census Citizenship Question: DOJ Wanted To Avoid Request During 'Comey Matter' The Trump administration has said the Justice Department needs a citizenship question on the 2020 census. But a newly unredacted memo shows DOJ staff initially "did not want to raise the question." 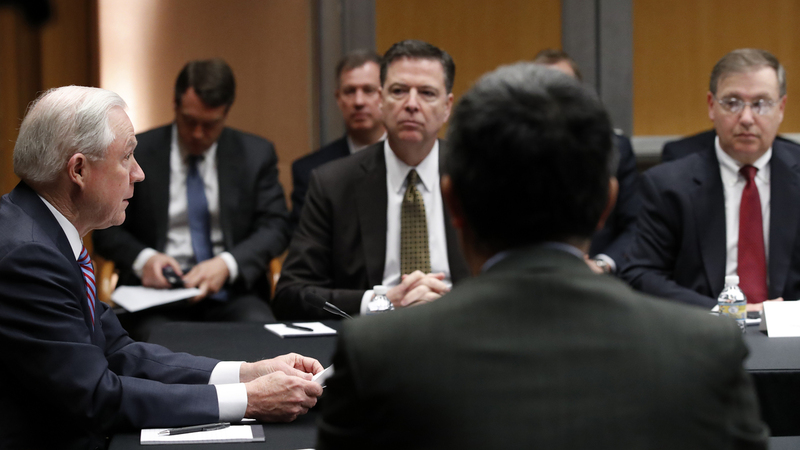 U.S. Attorney General Jeff Sessions (left) speaks with former FBI Director James Comey (center) and other officials at the Department of Justice in April 2017, in Washington. The internal document was written for Commerce Secretary Wilbur Ross, who oversees the Census Bureau and approved adding the question in March. Ross has testified before Congress that the Justice Department "initiated" the request for the question, in order to better enforce the Voting Rights Act's Section 2 provisions against racial discrimination. But memos and emails released previously as part of the lawsuits over the question already have contradicted Ross' testimony. They make clear that Ross was eager to add the question shortly after he was confirmed as commerce secretary in February 2017. Ultimately, the Justice Department did send a formal request to the Census Bureau in December 2017 for a question about citizenship status — a topic the Census Bureau has not asked all U.S. households about since 1950. That happened, however, months after Ross and his staff first reached out to the department about the request. Earl Comstock — a key Commerce Department official on census-related issues — first approached Justice Department officials in May 2017. Comstock eventually discussed the issue with James McHenry, a Justice Department official working on immigration issues who now oversees the immigration courts as the head of the Executive Office for Immigration Review. "Justice staff did not want to raise the question given the difficulties Justice was encountering in the press at the time (the whole Comey matter)," Comstock wrote to Ross in a newly unredacted portion of the memo, which is dated Sept. 8, 2017. Comstock's memo, which recounted his discussions with McHenry, appears to refer to media attention on President Trump's surprise, early-May firing of then-FBI Director James Comey, and the subsequent fallout. Under pressure from Ross to get a citizenship question onto the 2020 census, Comstock moved on to the Department of Homeland Security. But then-DHS official Gene Hamilton — a former Capitol Hill staffer to Sen. Jeff Sessions who eventually followed the now-attorney general to the Justice Department — referred Comstock back to the Justice Department. In another previously redacted portion of the memo, Comstock concluded by noting that he then directed James Uthmeier, an attorney at the Commerce Department, "to look into the legal issues and how Commerce could add the question to the Census itself." The internal memo was filed with Manhattan federal court on Monday by attorneys for plaintiffs in the citizenship question lawsuits from the New York state attorney general's office, the American Civil Liberties Union and the law firm Arnold & Porter. A spokesperson for the Justice Department, Devin O'Malley, declined to comment. The Commerce Department also declined to comment, citing pending litigation. In July, the Trump administration released a version of the September 2017 memo with redactions, citing "deliberative inter-agency communications regarding census discussions with DOJ." But last week, U.S. District Judge Jesse Furman ordered the memo to be released in full, as well as a redacted line in an Aug. 8, 2017 email to Comstock from Ross, who wrote about a call "about Census." "They seem dig in about not sling the citizenship question," Ross wrote in the email, "and that raises the question of where is the DoJ in their analysis ? [sic]"
During a court hearing last Friday in Manhattan, Furman said that these documents get to the "heart" of one of the central issues in this legal battle — Ross' intent in approving the addition of a citizenship question. He also noted the "need for public confidence" in the transparency and integrity of the 2020 census. The constitutionally mandated head count of every person living in the U.S. — regardless of citizenship status — is expected to reshape how political power and federal dollars are distributed in the next decade. The data affect the number of congressional seats and Electoral College votes a state gets, as well as how much of an estimated $800 billion a year in federal funding for schools, roads and other public institutions and services each state receives. Plaintiffs in the six lawsuits around the country argue that including a citizenship question risks harming the accuracy of the upcoming head count. Census Bureau research suggests heightened sensitivity towards such a question will discourage households with noncitizens from participating and lead to an undercount — one that could shift power and funding away from states with high populations of noncitizens, including immigrants who are living in the U.S. illegally. Ross is facing allegations that he misused his authority over the census and discriminated against immigrant communities of color by adding the citizenship question. "He personally lobbied the Attorney General to submit the memorandum that the Secretary 'then later relied on to justify his decision' ... after DOJ had already concluded they 'did not want to raise the question,' " the plaintiffs' attorneys write in a new court filing. A potential trial for the two New York-based cases is scheduled to start Nov. 5. Plaintiffs have been preparing by gathering documents and out-of-court testimony from Trump administration officials to prove their case. Judge Furman is deciding whether to order Ross' deposition as the plaintiffs have requested. Lawyers from the Justice Department, which is representing the Commerce Department and the Census Bureau in the lawsuits, have said they are prepared to ask the 2nd U.S. Circuit Court of Appeals to block such an order, but the plaintiffs' attorneys say only Ross can provide more insight into his decision. "This is astonishing, unprecedented conduct from a Cabinet member," the attorneys write in their filing. "It has consequences not for some minor or ministerial matter, but for the accuracy of the decennial census — which the Secretary agrees will affect 'foundational elements of our democracy.' "